A growing number of scientists have expressed interest in growing human tissues and organs in animals by introducing pluripotent human cells into early animal embryos. Formation of these types of human–animal chimeras holds tremendous potential for disease modeling, drug testing, and perhaps eventual organ transplant, say researchers. But uncertainty about the effects of human cells on off-target organs and tissues in the chimeric animals, particularly in the nervous system, raises ethical and animal welfare concerns. In 2009 the NIH issued guidelines for human stem-cell research that specifically prohibit introducing human pluripotent cells into nonhuman primate blastocysts and the breeding of animals into which human pluripotent cells may have contributed to the germ line. Given the direction of the science, however, NIH felt that it was an appropriate time to consider whether further policy provisions regarding other chimera models were needed before making funding decisions. Last fall the NIH put in place a funding moratorium for research proposing to introduce human pluripotent cells into animal embryos prior to the gastrulation stage. Since the moratorium was issued, NIH has reviewed the state of the science and also held a workshop last November 2015 to bring together leading experts in the field of chimera research and animal welfare. Now the NIH has published in the Federal Register and the NIH Guide to Grants and Contracts a proposal to make two changes to its policy in this area, for which the agency is seeking public comment. human cells are introduced into postgastrulation nonhuman mammals (excluding rodents), where there could be either a substantial contribution or a substantial functional modification to the animal brain by the human cells. NIH wants public comment on the proposed scope of the chimera research to be considered by the NIH steering committee. The committee will focus on the experimental design and likely nature of the chimeric animal model. The committee’s work will be independent of the peer review process. This committee will also monitor new developments in this field and provide analysis and advice to NIH leadership as needed. 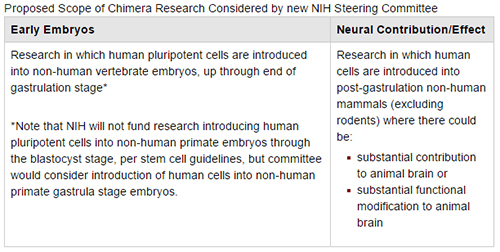 NIH is also seeking comment on modifications to the NIH Guidelines for Human Stem Cell Research where the agency proposes to expand slightly the current prohibition on the introduction of human pluripotent cells into nonhuman primate embryos to include the preblastocyst stage, and to clarify that NIH will not fund research involving the breeding of animals where the introduction of any type of human cell may result in human egg or sperm development. NIH officials say these actions are consistent with recently updated guidelines from the International Society for Stem Cell Research (ISSCR), which suggest that a specialized review of certain types of chimera research is appropriate. The ISSCR guidelines also contain useful suggestions of best practices for experimental design, which the research community is encouraged to consider, according to an NIH spokesperson. Public comments regarding the NIH proposal can be made at http://grants.nih.gov/grants/rfi/rfi.cfm?ID=57.